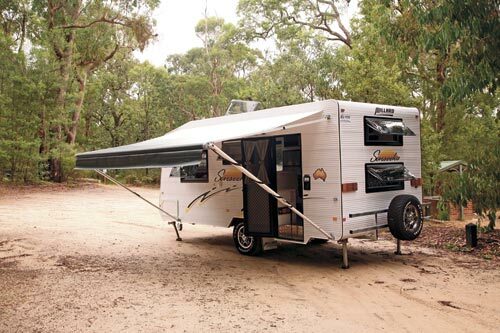 One of a few caravan manufacturers based in the Sydney region, Millard makes a wide range of caravans, pop-tops and slide-ons. Many of its caravans are large and well-appointed. But, for the budget conscious traveller, there is also a selection of less-costly vans, such as the Sunseeka 1700 model. A relatively light van, the Millard Sunseeka doesn’t have a mass of steel in the galvanised chassis. It’s quite simply built with a 100x50mm box section chassis and a similarly-sized drawbar. The chassis looks almost under-engineered but that’s more to do with what we are used to seeing in heavier vans and nothing to do with the engineering itself. 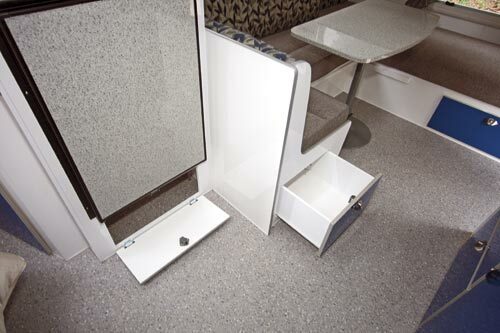 Like all Millard caravans, the Sunseeka has an aluminium frame with aluminium cladding. The van has Seitz acrylic, double-glazed windows and a familiar Camec security door. Instead of a front boot, there is front and rear tunnel storage, although the rear one can only be accessed from the offside. The Sunseeka might well be a budget van but it still comes with a Dometic awning. Stepping in through the Sunseeka’s rear door reveals an interesting layout and a striking colour scheme of blue, white and grey. This not only looks bright and cheerful but it’s a pleasant change from the common timber-look seen in many vans. 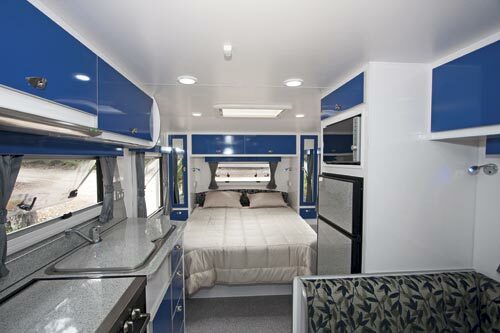 The van doesn’t have a bathroom, which results in a very open layout with a kitchen bench to the left of the entry, wardrobe to the right, front island bed, mid-offside fridge and rear offside dinette, which helps form the rear bunks. The two bunks measure 1.9x0.69m (6ft 3in x 2ft 3in) and occupy the space between the rear wall and the nearside wardrobe. The lower bunk is fixed in position and forms part of the seating for the club-style lounge, while the upper bunk has to be folded out, with the mattress coming from the lower bunk’s seat back. A lightweight aluminium ladder aids access to the top bunk. Because of the bunk arrangement, storage in this area is, perhaps, a bit more limited than it normally would be. But there are two overhead lockers, the corner wardrobe with three drawers underneath, an under-seat drawer and floor locker that gives access to the under-seat/rear tunnel boot area. One of the results of the bunk bed setup is an asymmetrical club lounge, a style often found only in much more expensive vans. It can seat four or five without too much trouble, although the small table is a bit less accommodating. And given the length of this van, it’s not really surprising that it has a small kitchen. Although this is a budget van, there’s nothing budget about the LED lighting system, in particular the blue and white reading lights. Fitting a 12V compressor fridge to a family van is a somewhat odd choice when compared to the benefits afforded by a three-way fridge because it limits the user to only being away from mains power for a night or two. It might not come with all the goodies found in many modern caravans; the Millard Sunseeka does have a number of advantages for the caravanning family on a budget. It’s not particularly heavy, so there’s a good chance it can be towed by the family car and it isn’t of great length, so it isn’t difficult to park and store. So it doesn’t have all the accessories considered necessary in today’s world of caravans, but it does have all the basics, including bunk beds, and, on top of all that, it is well-priced. It’s not a bad place for families to start. Or finish, for that matter.